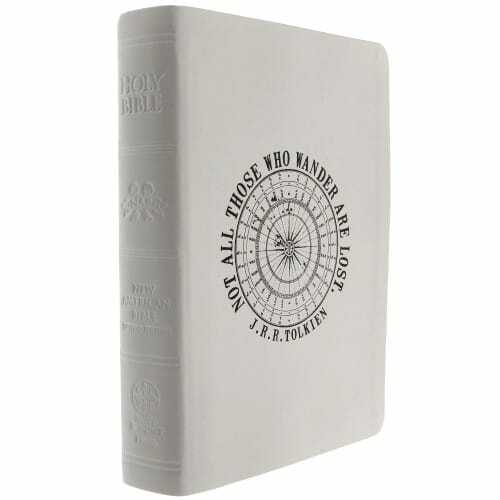 Circling a compass and printed against your choice of white or black softcover, Tolkien's timeless words are placed in a new light, and under it, their meaning only deepens. Upon receiving it, you will know two things to be true: Not all who wander are lost, and all who own this bible are blessed. Soft, leather-like cover with a satin ribbon tab. I absolutely love this bible! The quote from Tolkien on the cover is so unique and inspiring! The typeface is beautiful and the artwork is exquisite. I find myself constantly wanting to pick it up which has really increased the amount of time I spend reading my bible.